The Sinn 104 has become one of the best selling watches in the history of the company. The Sinn 104 I St Sa White Dial maintains all that's great about the Sinn 104 Series, but takes on a completely different look with the white dial, day and date wheels. And to make things even more interesting the date display alternates between German and English. This pilot's watch features a highly legible white dial, and the watch is water resistant to 200 meters. The ratcheting bezel is of Sinn's design and will not snap off the case if hit due to its screwed bezel construction. 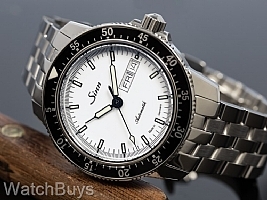 Verified Owner Comments: Regarding the watch, the Sinn 104 with white dial looks very sharp. Everything feels great from the crown to the bezel and on the wrist. My only cautions are with the fine link bracelet. While it looks fantastic with the watch, it is a scratch magnet. Especially at the clasp. Desk divers use caution. Also changing the bracelet out can be a hassle since the watch does not have drilled lugs and the bracelet fits very tight to the watch (a good thing). Watchbuys was fantastic to work with and I wouldn't hesitate to buy from them again. The watch was shipped the day after my order and it came in perfect condition. "Superb Product and Purchase Experience"
This watch exceeds anything else at its price point. The build quality and finish surpass that of watches that are twice the price. Furthermore, the WatchBuys Team was great to work with throughout the purchase. Communication during the purchase was awesome. The watch was delivered as scheduled and in perfect condition. Knowing that I could easily reach a WatchBuys rep at anytime throughout the transaction, for any questions or concerns, was also very reassuring. And there is additional value in that. I definitely recommend Sinn and WatchBuys if you are in the market for a German-made watch. 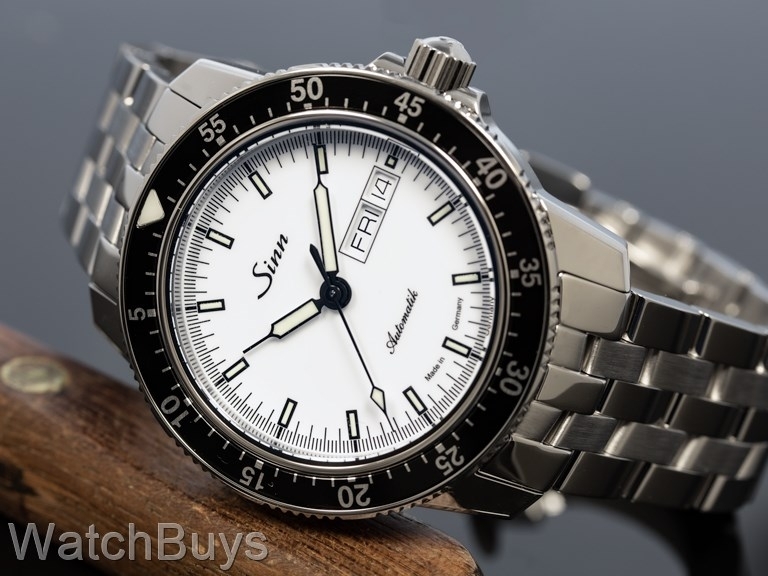 "Sinn 104 I St Sa White on Fine Link Bracelet"
Verified Owner Comments: I love this watch, but if this will be the first Sinn 104 purchase for someone's collection, I think that the better pick would be the black dial version of this model. The black is one of the most versatile watches made by Sinn. The white is probably more fitting for sporty summer wear. All versions of the 104 are great. I love the feel of the ratcheting bezel.